I am from a Naval family and have always been into sports so I was really pleased to join the Royal Navy to become a Nuclear Propulsion Engineer. After a year, I was picked to represent the Navy in hockey and then I became the team captain which was a dream come true and meant life was wonderful. Then one day during a match I was playing my ankles disintegrated and I was rushed into hospital for surgery. After coming round I found out there was nothing they could do and I was going to be discharged from the military, so I lost my job and my hobby all in one go. I went from feeling the luckiest person to being utterly devastated. The military mentality is that you push yourself and that pain is an emotion you can switch off. You are told if you think you want to stop you are probably only working at 60% whether it is sport or any other aspect of the military. You want to be the best you can be, we would be running in the morning, doing weights at lunch time then playing hockey all afternoon and that would be every day. I used to be super fit with a 28” waist and a six pack, I was at the peak of fitness and then it stopped all at once. After I was medically discharged it wasn’t great because the rehabilitation wasn’t there, I asked at the time what do I do now and I was told “you go home”. It was difficult and I did what most sailors would do, I went to the pub and that became my new normal. Then when depression and anxiety took hold I stopped going to the pub and stayed at home and got fatter and fatter. Everybody who was a friend was a hockey player and I didn’t want to be around them. Even though at first tried watching them, everything I had worked for at school and college were for the navy and my sports career and this was no longer my life. Integration back into civilian life was the hardest thing because civilians think very differently to military people, I was in a lot of pain and pushing myself through a pain threshold which would make me grumpy. I wasn’t getting better and people didn’t understand didn’t know how to deal with me because I didn’t want to give up. Things changed radically by accident after Prince Harry had been to the Warrior games for injured veterans and he decided to create the Invictus games. 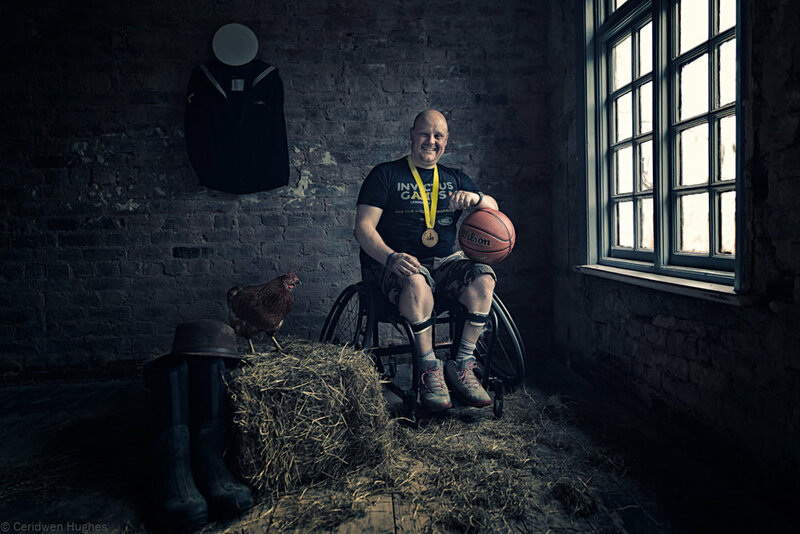 I met someone from Help for Heroes who invited me to go for wheelchair basket ball trials. I said “you’re joking, I’m twenty stone and I don’t do sport, that was my old life”. They were so persuasive I ended up being squeezed into one of their wheelchairs and I was able to move fast for the first time in ages, it was brilliant. I was surrounded by people with various body parts missing, we were having a laugh and everyone was sweating but it was good to be alive, to feel that adrenaline again. From that first training session the head coach was an officer still serving in the marines and he was shouting and really pushing us, it was like being back at basic training again. He said go away and this is what you need to work on for the next training session in three weeks. I contacted the local school where my kids go and they opened up their sports hall for me at 7am in the morning. This became my new routine, to get up in the morning, go to the gym to exercise, come home and push the weights, it made me feel alive. The squad kept reducing I kept getting through until I made the final team to go to the games in London. The support I experienced from the British people was amazing, there were 10,000 people in the Copper Box to watch the basket ball and it broke the sound decibels measured at the Olympics. When it came to the final the Americans figured they were unbeatable, but we would have crawled over broken glass for each other in our team and we played as such a team it was always going to be our gold. We smashed them in the end winning 19 goals to 9. It was unbelievable. Since the Invictus I give motivational speeches about mental health and I have starting a care farm business. I feel a pride again and I’ve got a purpose to help others on their journeys. At the farm we have alpacas so we can take people walking with them, we have chickens which have so much personality and of course we collect their eggs to make cakes and biscuits. We have honey from our bee hives and use the wax to make candles, the idea is to create a place where people can just be themselves without pressure or to learn new skills. There is the possibility for helping out with the animals, do a chain saw course or learn how to build a log cabin, it is a big project but we’ll get there.